Thinking about repiping your home or business may seem like a daunting task, but ultimately a necessary one. When your pipes grow old and damaged over time, or if they simply burst, leaving you with a mess to clean up, you need a trusted repiping company in California serving Aliso Viejo. At Integrity Repipe, our plumbers know just how important it is to have working plumbing in your home or business. Highly trusted and top rated, we can get the job done right. With an A+ Rating with the Better Business Bureau, and five-star reviews on both Google and Yelp, making sure that your plumbing is re-installed professionally and properly is our number one priority. With experienced plumbers to take care of the piping in your home, you don’t have to worry about the integrity of your pipes. 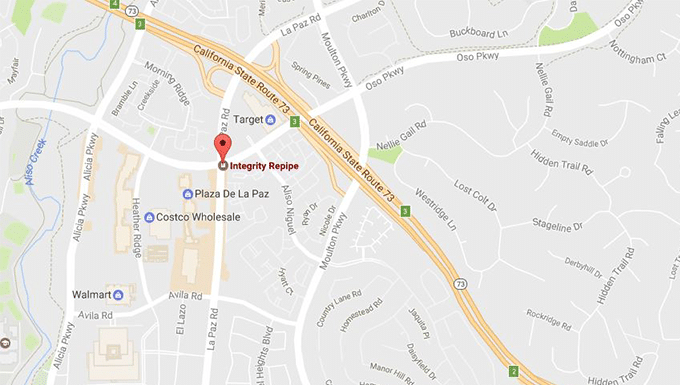 For an affordable repiping company near you in Aliso Viejo, Integrity Repipe is here to help. 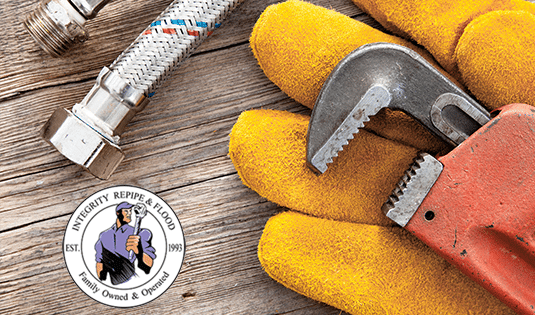 We provide a variety of repiping services in the Aliso Viejo area including copper pipe replacement, pex pipe repair and replacement, leak detection, and much more. Repairing or repiping the plumbing in your home may seem like a stressful project to undertake, but the plumbing experts at Integrity Repipe can make sure that the process is easy and burden free. We are a top rated, trustworthy, repiping specialist company that is dedicated to providing excellent plumbing and repiping services for those in the Aliso Viejo region of California. Affordable and professional, Integrity Repipe can make sure that your pipe replacement project is done in a timely manner. Since 1990, Integrity Repipe has been providing excellent copper pipe replacement and plumbing services for residential properties, pex repiping and plumbing services, old pipe replacement, lead pipe replacement, and much more. Offering affordable repiping and plumbing for your home or business is just one of the many reasons you should trust Integrity Repipe to replace or repair leaks, damaged pipes, and old pipes in your residential home. When leaks occur in your pipes, it is often due to worn out materials, and systems that are not properly installed. Often times, newer homes also have leaks due to recycled copper pipes made in China. For pipe leak detection from a top-rated repiping company, Integrity Repipe can install new pipes into your home that are manufactured right here in the USA with a lifetime warranty. When people make the bold decision to have their home or business repiped due to problems with the CPVC pipes, copper, or galvanized pipes, they often choose to replace them with PEX piping. For top rated, trustworthy PEX plumbers, Integrity Repipe can replace your outdated pipes with an upgraded PEX system that will both last longer and be more efficient for your home or business. 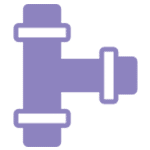 When repiping your home, it is important to consider the different kinds of materials that are used and the life span you are looking at when choosing your piping material. Although Copper piping is cheaper and more common, PEX piping lasts much longer and is far more durable than copper. For expert repiping experts, trust the Aliso Viejo top-rated repiping company, Integrity Repipe to take care if your copper or PEX plumbing. With non invasive leak detection, Integrity Repipe in Aliso Viejo is just the residential repiping company to take care of your leaky pipes and and full pipe replacement. 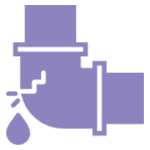 When the plumbing in your home becomes damaged resulting in low water pressure, leaks, rusty water, and other issues that come along with unsteady pipes, Integrity Repipe can help restore your plumbing to its proper working condition. With free estimates on your repiping job and rapid project completion, you can trust the technicians at Integrity Repipe to take care of your repiping project in a reasonable timeline to get your plumbing in proper working order! Our repiping experts can replace your home or business’s plumbing with efficiency and expertise. For more information about pipe replacement services in Aliso Viejo, contact Integrity Repipe today!